Engine 6 and Brady Street were so intertwined that, for some, it seems hard to imagine one without the other. Published Dec. 18, 2017 at 10:02 a.m. In September, City of Milwaukee budget cuts forced the announcement of the closings of a number of Milwaukee Fire Dept. firehouses and the decommissioning (and recommissioning) of engines and ladder trucks. Closure of Fire Station 31, 2400 S. 8th St.
Decommissioning of Engine Company 6, 1693 N. Franklin Pl. Decommissioning of Engine Company 31, 2400 S. 8th St.
Decommissioning of Truck Company 15, 5335 N. Teutonia Ave.
Recommissioning of Engine Company 11, 2526 S. Kinnickinnic Ave.
Recommissioning of Engine Company 37, 5335 N. Teutonia Ave.
As the 8 a.m. deadline approached, Engine 6's firefighters packed up their belongings on Brady Street – where a firehouse first opened in 1875. The refrigerators were cleaned out, the holiday decorations outside were coming down, lockers were emptied. But also, hugs were exchanged, hands were shaken. As retired company members returned to say goodbye, there were laughs, memories shared, anger expressed – along with disbelief – and I'm pretty sure I saw some damp eyes. By 8, neighbors began to arrive, too. That's because Engine 6 is one of the houses in this town that is most connected to its neighborhood. With its kitchen windows right along the sidewalk, it was almost like the firefighters here were on public view around the clock. And for the past couple decades, these firefighters were quite comfortable with that. In fact, they injected themselves into the neighborhood. 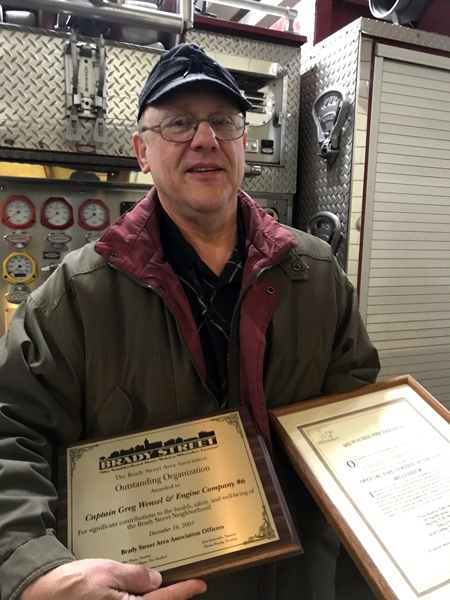 Most everyone credits Captain Greg Wenzel, now retired (and pictured at right), with linking Engine 6 more profoundly with its surrounding community. "I didn't think I'd live to see this day." I also talked to some neighbors about the closure. "I personally feel it's horrible," said Giuseppe Vella, who owns Sciortino's Bakery, just across a small parking lot from the firehouse, recently. "Engine 6 has become an icon to the neighborhood. "As for business we will miss them stopping in each morning for their baked goods, but most importantly we will miss their presence on the street and the life that they bring to the neighborhood as the roar down the street. Honestly, just really not going to be the same. It's like taking away the church bells." 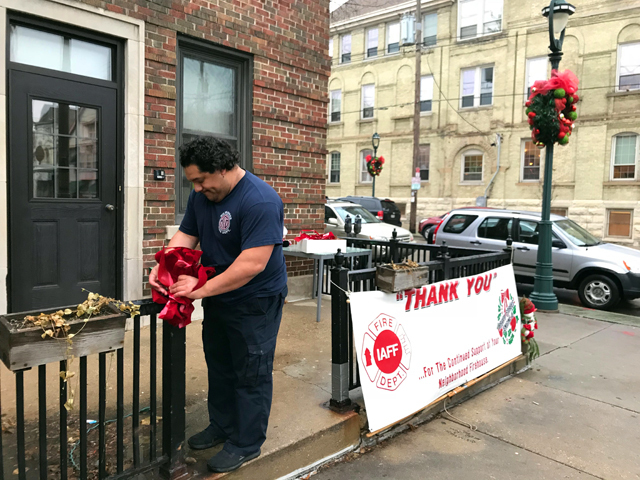 Those bells tolled almost eerily as current and former firefighters mingled with neighbors and well-wishers this morning before a planned "wake" honoring Engine 6 at Hosed on Brady, 1689 N. Franklin Pl., adjacent to the Engine 6 quarters. One of those present was Teri Regano, who owns Regano's Roman Coin tavern up the street, opened by her father in 1966. Regano has concrete reasons for fearing the loss of Engine 6 a few blocks from her business. "I will forever be grateful to Engine 6 for saving the life of my father twice, his sister's life once and for countless neighbors and friends in the neighborhood who have had medical emergencies," she told me. "I think this was their No. 1 role in our area, especially since the density has increased so dramatically in the past several years and continues to increase with every new apartment complex that is approved by the City. They have been there all my life. A comforting presence. "I am saddened by the decommissioning. I went to the Common Council budget hearing to express my concern of the closing of this fire house in the most densely populated part of Milwaukee. I am extremely disheartened that they did not find a way to keep it open. I fear for my neighborhood's well-being and I will miss walking by and seeing their faces, knowing that they were always ready to protect and save us. Not just firefighters, but friends and neighbors who were active in the community. They've allowed me to commandeer their kitchen every February since 2002 for the Brady Street Area Association's Chili Social and graciously transported very heavy tables and chairs from the Tamarack school so that neighbors could socialize and sample chili in the dead of winter." 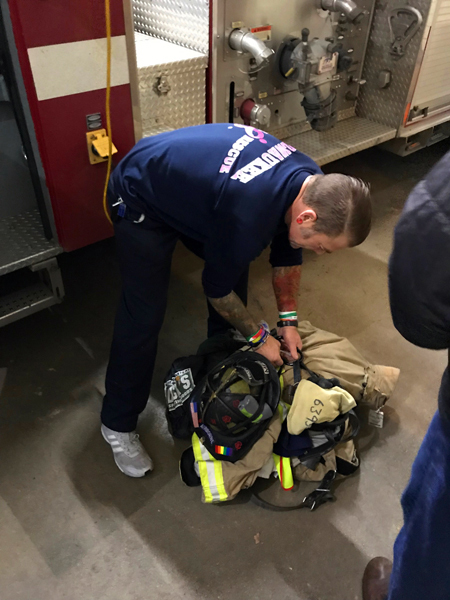 At 8:05 a.m., as Regano looked on, the Engine 6 rig drove out of the firehouse and onto Brady Street for the last time for the foreseeable future (today's recommissionings suggest there is hope for a return someday). Unsurprisingly, active MFD employees declined to talk on the record, but former Engine 6 captain Carter Hunnicutt, who retired in June 2016, did not. 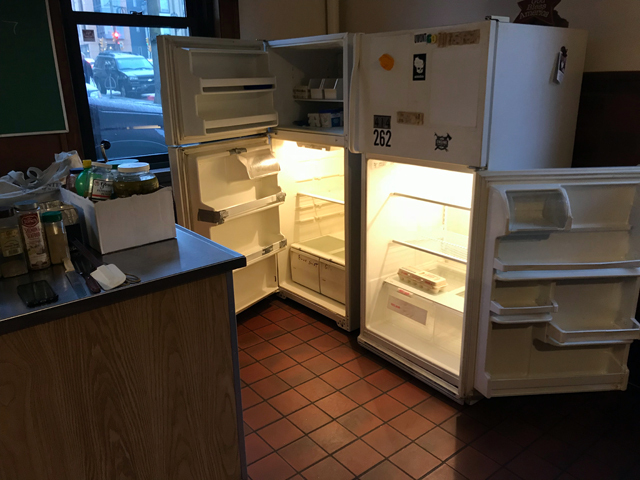 "Yes, there are other units that will cover the Brady Street area and on the vast majority of emergencies people will still get the kind of professional service they deserve. But the low frequency, high-risk events could well cost lives of residents and rescuers. "But I am especially sad for the Brady street neighborhood. The Engine 6 members know every alley and hydrant and have been deeply involved in the community." Hunnicutt knows the Brady Street area well, especially from a firefighting standpoint and he said the loss of Engine 6 will be regretted. "The area around Brady street is unique in Milwaukee," he said, echoing Wenzel. "On the lower East Side many buildings overhang each other and in many cases the buildings literally touch. There are taller apartment buildings and high-rise structures. The population is more concentrated. 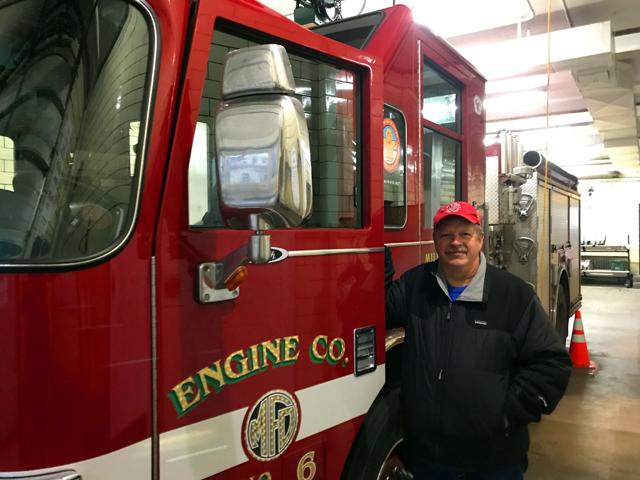 Retired firefighter Randy Leach – now a key figure in the Milwaukee Fire Education Center and Museum got his start at Engine 6. He lives five blocks away from the station. "So when a fire gets going on the East Side it is almost always fast-moving and puts many people and multiple buildings at risk. Truck 5 from Bartlett Street was performing search and rescue above the Pizza Man restaurant and barely got out when conditions deteriorated in an instant. We could easily have buried five guys. These fires are incredibly risky for both residents and firefighters. Rapid response times are critical to effectively mitigating these emergencies." Hunnicutt, who was clearly moved as he stepped into the station this morning just before 8 a.m., said there's plenty of blame to go around for the closings taking place over the past month. "I'm not nearly so much bitter or angry as I am disappointed, I see the current situation as a result of poor leadership in the union, department, city and state," he said. "A failure to work together from all parties. A failure to understand or an unwillingness to accept what the actual issues are and what actions are truly needed. That and a willingness to push agendas regardless of the impacts. I would apply these criticisms fairly evenly from the individual union member to the aldermen, to the mayor and to the governor."